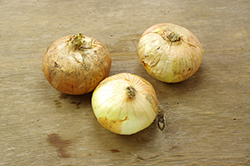 Almost the size of footballs, Georgia’s famous Vidalia onions are available only in the late spring and early summer, just in time to kick off the barbecue season. When slathered with a mustardy sauce from the same state, smoked Vidalias and other sweet onions become golden orbs of succulence. 1. Prepare the smoker for barbecuing, bring the temperature to 200°F to 220°F. 2. Slice each onion in half and peel the outer layer. 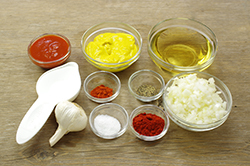 Cut down to, but not through the base of each onion half in criss-cross directions to make an onion “flower.” Rub or spray a thin coat of oil over the onions and wrap each half in foil. 3. Transfer the onions to the smoker and cook for 30 to 35 minutes. 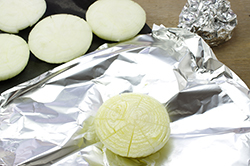 Remove the foil or peel it back to form a flat base and brush the onions with a thick coating of barbecue sauce. 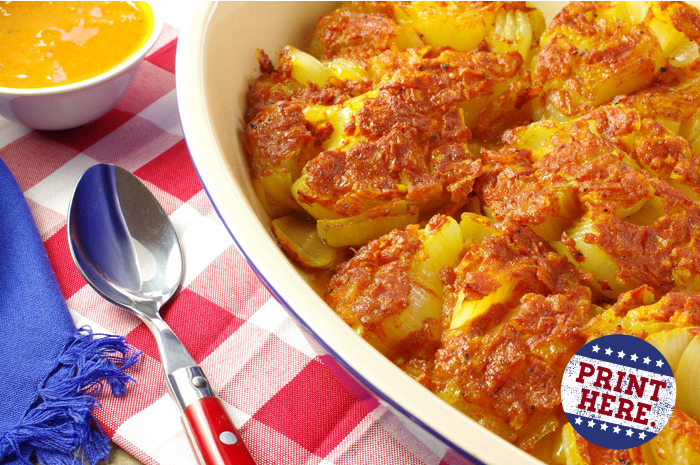 Continue cooking until the onion is tender, 35 to 45 minutes more. 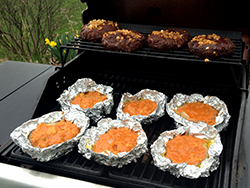 Remove the onions from the smoker and brush with additional barbecue sauce before serving. BBQ TIP: If you want to experiment with vegetables, keep a couple of general principles in mind. Usually you coat vegetables with oil before putting them in the smoker, to keep them from drying out. You can do this by hand or by spritzing them with a spray oil. That may be all you do, because simple preparations are often the best. You may want to play creatively with dry rubs, pastes, marinades, or mops, but you are less likely to need them than when you barbecue meat. 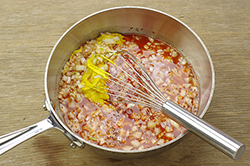 In South Carolina and Georgia, mustard-based sauces provide the strongest competition to vinegar mixtures. Start with the smaller amount of mustard and keep adding until it suits you. Mix the ingredients in a saucepan and bring to a simmer. Reduce the heat to low and cook until the onions are tender and the mixture thickens, 20 to 25 minutes. Use the sauce warm or chilled It keeps, refrigerated, for a couple of weeks. 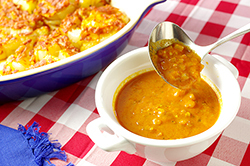 VARIATION: HONEY-MUSTARD BARBECUE SAUCE – Substitute an equal amount of honey for the tomato puree. Skip the paprika and the garlic if you like. Reprinted with permission from Smoke & Spice by Cheryl and Bill Jamison. Copyright 2014. Published by Harvard Common Press, Boston, MA. All rights reserved.